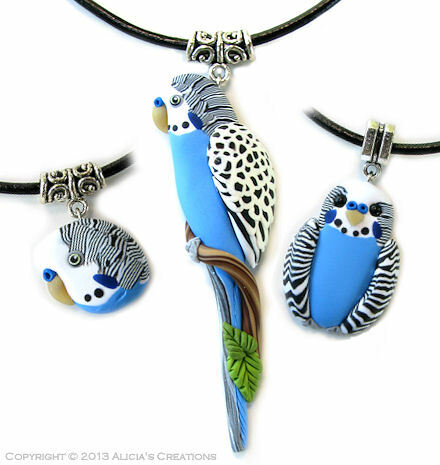 BIRD OF THE MONTH: Blue Budgies + "Faux Birds"
It's Budgie time! 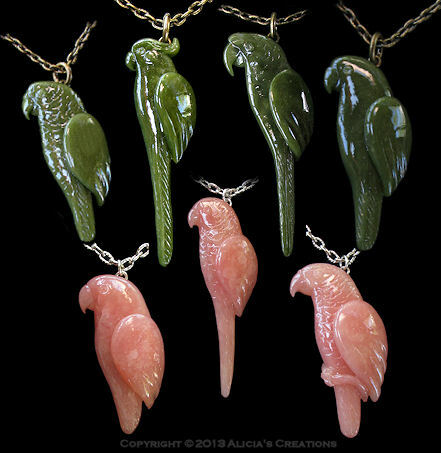 I rarely offer budgies on eBay, since these are one of the most time consuming birds to make, but last month when I was finishing up some custom orders with budgies, I decided to go ahead and create a few for you! There is a full bodied budgie, a budgie face, and a "Kawaii styled" budgie. The budgies are being auctioned eBay for five days, ending on Wednesday, May 22. I recently had fun playing around with an attempt to recreate jade and rose quartz in polymer clay! I've been working with polymer clay for nearly 20 years now, and the versatility this amazing stuff still continues to astound me. There is no end to the different looks that can be achieved with it! The necklaces are all being auctioned on eBay for five days, ending on Wednesday, May 22.